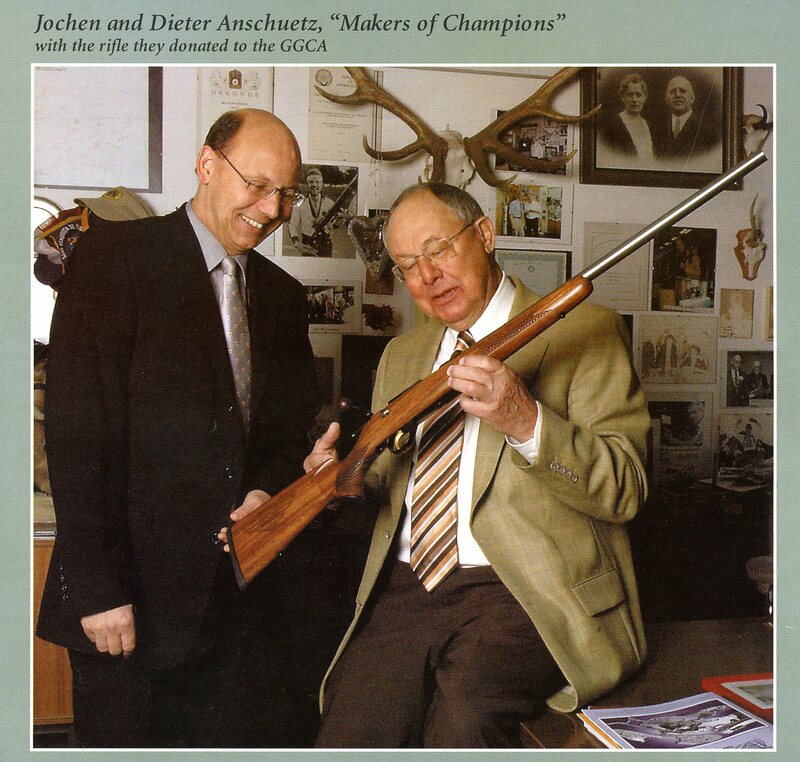 The Anschütz family is a very extensive one with a long history in the gunmaking trade. A large book could be written about this family and still it would not be complete. 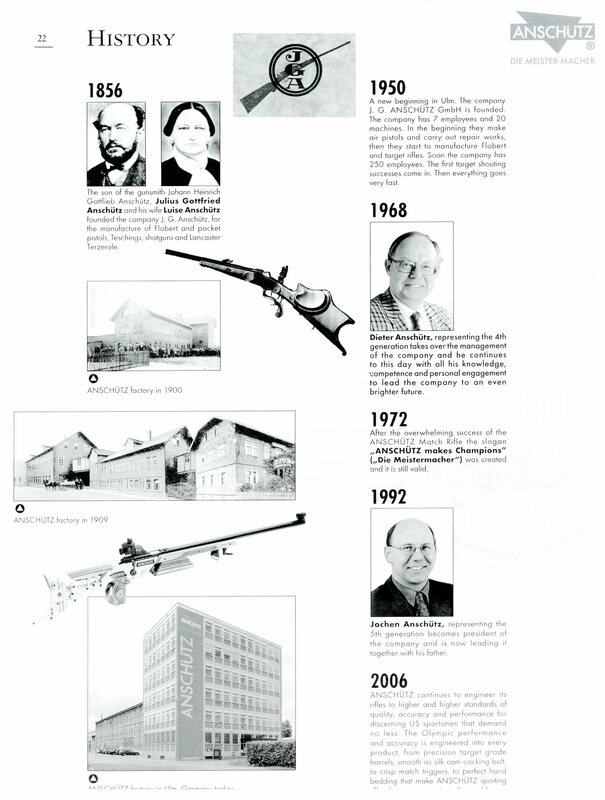 Not only was the Anschütz family very large but also had familial ties to the Bössel, Bornmüller, Moritz, Schlegelmilch, Schmidt and Spangenberg’s, all gun making families in Suhl and the surrounding areas. We have several good references to glean information on the Anschütz family from. For the early history we have “Suhl-Heimat Der Büchsenmacher” by Hans-Jürgen Fritze and for the 19th and 20th Centuries we have “Alt Scheibenwaffen” by Tom Rowe, Jesse Thompson, C. Ron Dillon, Allen Halock and Bill Loos. 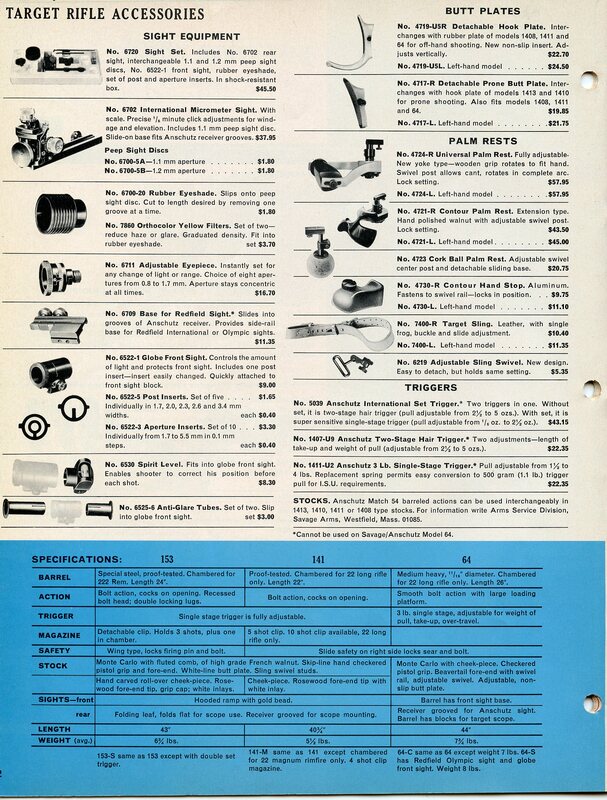 The chapter- Directory of Makers & tradesmen 1885-1935 from Alt Scheibenwaffen was compiled by Mr. Jesse Thompson and is used courtesy of Mr. Tom Rowe. The J. G. Anschütz company ( Germania Waffenwerk AG) history will not be repeated here but can be viewed by going to the history page of their excellent web site. Click Here to do that. Any history of the City of Suhl in Thuringia will undoubtedly include mention of the Anschütz family. They first appear in records in the 15th and 16th Centuries. 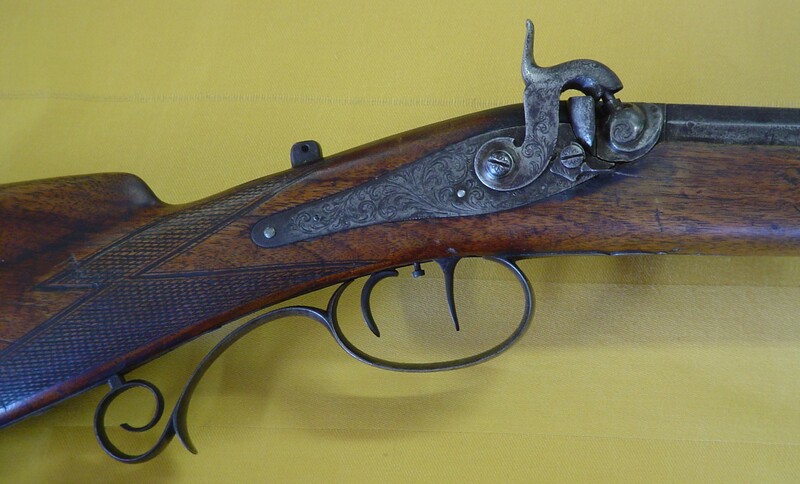 In 1606 Clauß and Jacob Anschütz joined forces with other talented gunsmith’s to establish a substantial Gun shop. A Johann Anschütz who lived in neighboring Mehlis had a son- Balthasar Anschütz who married the daughter of the Bürgermeister of Mehlis, a Herr Menß on Sept. 25, 1618 and at the same time moved to Suhl. The son of Balthasar was Stephen Anschütz (1628-1674) who was a Baker, Driver and Councilor. His son Johann Daniel Anschütz the Elder (1660-1683) married Barbara Christine Hoffmann. He may have worked for a short time as a gun maker. His son Johann Daniel Anschütz the younger (1683-1728) definetely was referred to as a Gewehrhändler. After Johann the Elder’s death in 1683 Barbara married Sigismond Bössel (March 18,1646-1726) who was a noted gun dealer and at some point Sigismond and Johann Daniel the Younger worked together as Bössel & Anschütz. In 1753 a devastating fire in the City of Suhl destroyed the Waffenfabrik of George Daniel Anschütz and the independent shops of Caspar and Zacharias Anschütz. Very little is known about Caspar and Zacharias but we have more information about George Daniel. George Daniel married Dorothea Andreae who passed away in Suhl in 1775. George Daniel and Dorothea had a son Johann Matthäus Anschütz (1743-1802) who besides being a gun maker or dealer attended University and also devoted himself to writing and poetry. He wrote the poems “Journey to the Dolmar”, “Schneekopf” and “Rappenbrunnen” and in 1784 wrote a book about the Suhl rifle and Textile trade. He first worked for the firm of Bössel & Anschütz and later became the director of the Anschütz rifle factory in Suhl. Johann Matthäus also wrote a short history of Suhl and in 1788/89 he wrote a two volume work on the Geology of the Henneberg. He was an honorary member of the “Leipzig Economic Society” and the “Royal British Historical Institute in Göttingen” and was one of a close circle of good friends of the famous engraver Johann Veit Döll. 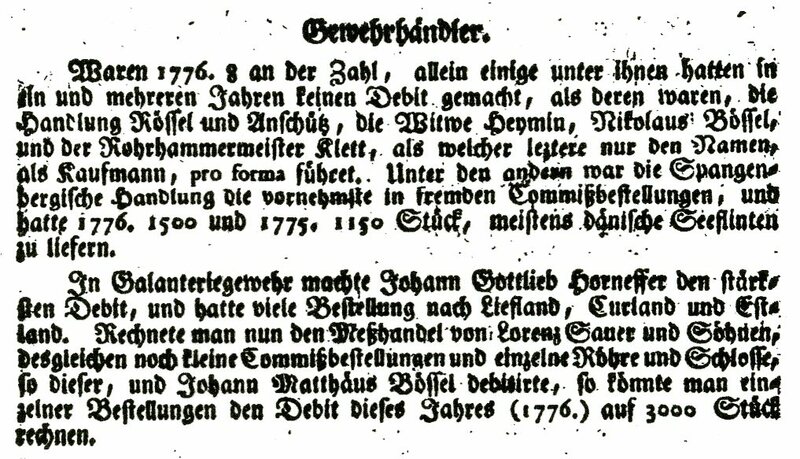 Johann Matthäus’ son Heinrich Daniel (1765-1829) learned the gun trade also and specialized in the gun Locksmith work. He eventually became the head of the waffenfabrik Anschütz & Sohne and as such was a fully trained rifle manufacturer. In 1811 he wrote the well known book “The Rifle Factory in Suhl” which is still availible as an important source on that subject. Heinrich Daniel was married to Elisabeth Barbara Schmidt and lived at Steinweg no. 73/74 (now Steinweg 18) and in 1785 along with his father made arms for the Electoral Arsenal which were marked “M & H Anschütz“. 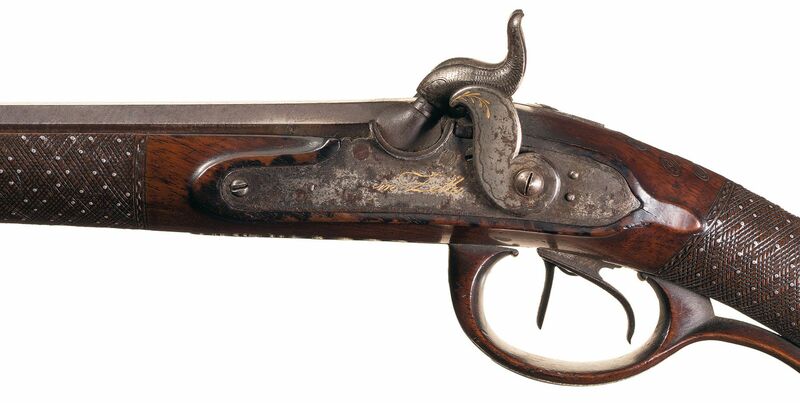 Starting in 1809 Heinrich Daniel supplied a Carbine Lock for the Bavarian Model 1804 for the main Arsenal in Munich and from 1813 to 1818 supplied complete rifles, carbines and pistols to the Bavarian Ministry of War. He was a member of the Academy of Sciences and listed by them as an Artist. Heinrich Daniel Anschütz and his wife Elisabeth Barbara had a son Friedrich Christian Anschütz (1790-1832). In 1815 he was referred to as a Gwehrhändler and married Friederike Wilhelmine Spangenberg ( -1826) who was the daughter of the Banker and Gun Manufacturer Johann Heinrich Spangenberg (1760-1824). Friedrich Christian marked his guns with “Anschütz-Suhl”, “FCA over the city of Suhl mark” and “F.C. Anschütz & Son”. He had a bayonet grinding mill on the Steina at Gothaer Straße 157. His children were Heinrich, August and Elli Anschütz. Heinrich bought a quarter interest in the “Alt Heinrichser Hammer” (Old Heinrich’s Forge) in 1850 from Rosine Friedrike Wilhelmine Bornmüller. Heinrich married Christiane Schlegelmilch, the daughter of the Forge owner Erdmann Schlegelmilch. The above information was interpreted from the referance- Suhl- Heimat der Büchsenmacher by Hans-Jürgen Fritze. Peter Arfmann and Rolf Kallmeyer in their book J. P. Sauer & Sohn (Peter Arfmann -Verlog, 2004) includes the following paragraph outlining the content of a notice in a 1786 paper. With thanks to Tom Rowe and Jesse Thompson for the material from Alt Scheibenwaffen we now enter 19th and 20th Centuries with an alphabetical listing of other Anschütz gun makers and dealers. It is rather important to mention here that the seperate communities of Zella St. Blasii and Mehlis became one known as Zella-Mehlis in 1919. Anschütz & Jehsert- Of Zella-Mehlis, listed as gunmakers in 1914, as wholesalers in 1920 when it was owned and operated by Hugo & Emil Anschütz. ref.- Guns Directory by John Walter. Albert Anschütz- A gunmaker whose shop was located at Am Friedhof 8, Zella- St. Blasii in 1912. Albert Anschütz- Gunmaker at Gr. Bahnhofstrasse 17, Zella- st. Blasii in 1912 and at Bahnhofstrasse 57 in 1929. Alfred Anschütz- another gunmaker at Bahnhofstrasse 17, Zella-St. Blasii in 1912 and at Bahnhofstrasse 37 in 1929. Relatives no doubt and possibly father and son. Alfred Anschütz- Gunmaker at Forstgasse 9, Zella-Mehlis in 1929, working for Bruno Helfricht. Alfred Anschütz- A gunmaker located at Schoenauerstrasse 46, Zella- Mehlis in 1929. The son of Fridolin Anschütz. Alfred Anschütz- A gunmaker at Klettswiese 3, Zella-Mehlis, from around 1927 up to 1936. Alwin Anschütz- A Meister gunmaker of Mehlis in 1888. Andreas Anschütz- Gunmaker of Mehlis. He was a competitor at the XV Deutsches Bundesschiessen at München in 1906. August Anschütz- Gunmaker at Steinweg 4, Zella-Mehlis in 1929. The son of Karl Anschütz. Died in 1929. August Anschütz Senior- A Meister gunmaker of Mehlis in 1888. August Fritz Anschütz- A son of J. G. Anschütz. Click Here to read more about J. G. Anschütz and Germania Waffenwerk. Bolte & Anschütz- Founded in 1868 by J. L. Bolte & L. Anschütz. manufacturers of “Stahl und Eisenwarren, Waffen. Held D.R.P. #8538 of March 15, 1879 for a hand operated scroll saw. Mahrholdt’s Waffen Lexikon states that they made small caliber and Flobert guns. Bruno Anschütz- (Nov. 14,1881- Nov. 3, 1951) He set up his oen shop at Oberschonauerstrasse 3, Mehlis in 1903 at the age of 22. By 1925 the shop was located at Marktstrasse 7. By the 1920’s he appears to have been specializing in high quality sporting guns and particularly in the Scheibenbüchsen or single shot target rifles. At some time during the Depression years of the 1930’s he opened a small grocery store in his home at Louis-Anschütz-Strasse and it is assumed that he dropped out of the gunmaking trade altogether at that time. Caspar Veit Anschütz-A Meister (Master) gunmaker in Mehlis in May 1888. Image is courtesy of Mr. Tom Rowe, publisher of the books Alt Scheibenwaffen. Curt Anschütz- Gunmaker in Zella-Mehlis from 1919 until World War II. In 1925 he was located at Bierbachstrasse 5 when he advertised that he made Hunting, Sporting and small guns. In 1927 he was located at Bierbachstrasse 9 where he advertised that he made target guns and did gun repairs. 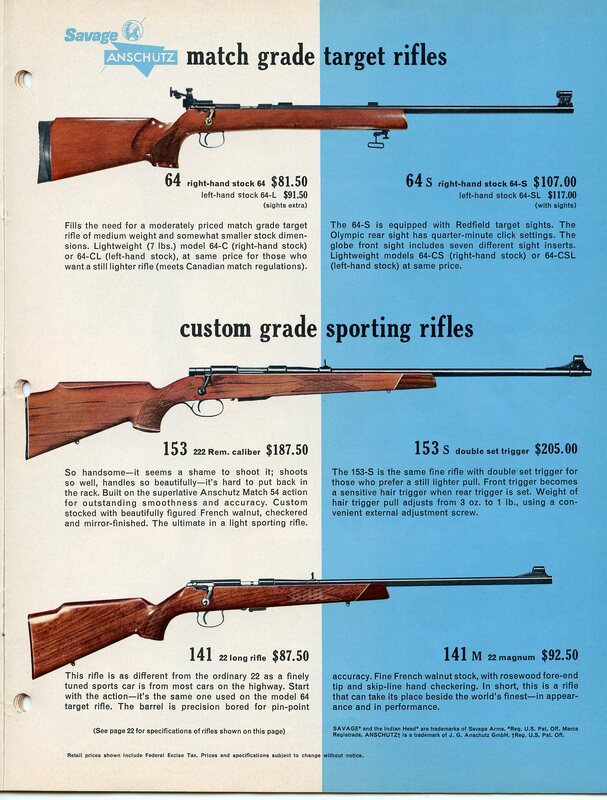 The 1929 directory listed him as being only a retailer of sporting guns. In 1936 he again advertised himself as being a gunmaker at Beirbachstrasse 29. In 1940 and 1943 Curt Anschütz advertised only his gun repairing activities. Edmund Anschütz- A Meister gunmaker of Mehlis in May 1888. Emil Anschütz- A gunmaker located at Am Schiestand 37, Zella-Mehlis in 1929. Erdmann Anschütz- Gunmaker at Bahnhofstrasse 26, Zella-St. Blasii in 1912 and at Bahnhofstrasse 32 in 1929, the year he died. Erich Anschütz- A Meister gunmaker of Mehlis in May 1888. Ernst August Anschütz- an engraver in Zella-St. Blasii and the father of Udo Anschütz. Ernst J. Anschütz- Located in Mehlis circa 1820, his guns were simply marked “E. Anschütz”. Ernst Karl Anschütz- A Meister gunmaker at Mehlis in 1888. Forty-one years later (1929) an Ernst Karl Anschthe same man?) was listed as being a gunlock maker at Kaffenberg 22. In 1936 he was listed at the same address as a gunmaker. F. C. Anschütz- Located in Suhl circa 1835-1860. Marked his guns “F. C. Anschütz & Sohn”. Fridolin Anschütz- Gunmaker at Kleine Bahnhofstrasse 1, Zella-St. Blasii in 1912. Fridolin had son named Fritz. Fritz Anschütz- Gunmaker at Schonauerstrasse 46, Zella-Mehlis in 1929- 1936. The son of Fridolin. Fritz Anschütz- Gunmaker at Mehlis in 1926. Fritz Anschütz- Gunmaker at Insul 15, Zella-Mehlis 1929-1936. August Fritz Anschütz- August Fritz ( he went by Fritz) Anschütz (June 10, 1871- March 24, 1935) was the son of Julius Gottfried and Marie Luise Anschütz. He and his brother Otto learned the gunmaking trade from their father and carried on the family business. For more click Here to go to the Anschütz website. Gottfried Anschütz- A Meister gunmaker of Mehlis in 1888. Heinrich Anschütz- A Meister gunmaker of Mehlis in 1888. Hugo Anschütz- A gunmaker at Hauptstrasse 64, Xella-Mehlis in 1929 who was at that time also a beer distributer. By 1936 the name Hauptstrasse had been changed to Adolf-Hitler Strasse, but Hugo Anschütz was still practicing gunmaking at number 64. Hugo Anschütz- A gunmaker at Schonauerstrasse 82, Zella-Mehlis during 1929-1936. Johann Hermann Anschütz- A meister gunmaker at Mehlis in May 1888. Julius Gottfried Anschütz- (May 23, 1834-Oct. 27, 1901) was the son of the gunmaker Johann Heinrich Gottlieb Anschütz. He and his wife Marie Luise founded the firm J. G. Anschütz and his two sons who followed him in the business were Fritz August and Otto Veit Anschütz. For more about Julius click here. Karl Anschütz- Gunmaker located at Denkmalstrasse 5, Zella-Mehlis during 1929-1936. The son of Franz Anschütz. Karl Otto Anschütz- A gunmaker at Lammermannstrasse 6, Zella-Mehlis during 1929-1936. Otto Anschütz- A gunmaker located at Märzenberg 38, Zella St. Blasii in 1912. Otto Anschütz- A gunmaker at Böhmerbergstrasse 4, Zella-Mehlis during 1929-1936. Otto Anschütz- A barrel maker located at Talstrasse 28, Zella-Mahlis during 1929-1936. Peter Anschütz- A Meister gunmaker of Mehlis in May 1888. R. Anschütz- No known first name, a gunmaker who lived and worked in Zella St. Blasii circa 1850. 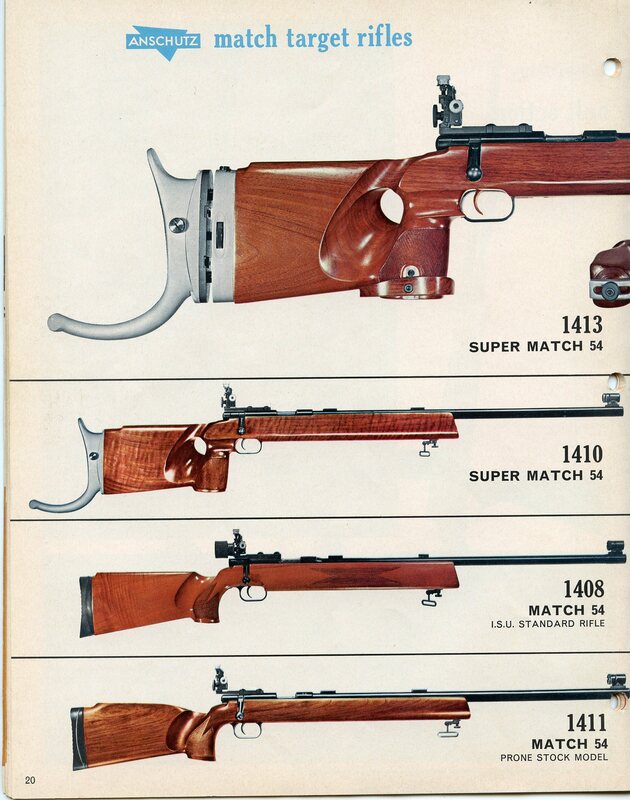 The following pictures show a percussion single shot rifle made by him. Reinhold Anschütz- A Meister gunmaker of Mehlis in May 1888. A Reinhold Anschütz was listed as being a gunlock maker at Am Kohlenmagazin 7, Zella-Mehlis in 1929 who may have been the same man. Richard Anschütz- A Meister gunmaker of Mehlis in May 1888. In 1912 the shop was being run by Robert Anschütz, his son at Meiningerstrasse 13, Mehlis. In 1925 the firm was listed as being at the same address still under the Richard Anschütz name. They advertised Zimmerstutzen, Pirschstutzen & Scheibenwaffen. In 1929 the firm was located at Meiningerstrasse 15 while Robert Anschütz, the manager lived at Meiningerstrasse 52. By 1936 the street’s name had changed to Strasse der SA and Robert Anschütz had both the shop and his home at number 52. It is reasonable to assume that Richard Anschütz, the firm’s founder, probably died some time before 1912. Richard Anschütz- A gunmaker at Gabelsbergstrasse 9, Zella-Mehlis in 1929. Robert Anschütz- The son of Richard Anschütz. For more see that entry above. Rudolf Anschütz- A gunmaker at Sommerauweg 13, Zella-Mehlis in 1929. The son of Ernst Anschütz. Rudolf Charles Anschütz- (Nov. 21, 1899- April 24, 1975) The son of Fritz Anschütz and the grandson of Julius Gottfried Anschütz. He and his brother Max (Aug. 28, 1902- ) took over the business of the Germaniawaffenwerk when their father Fritz passed away in 1923. 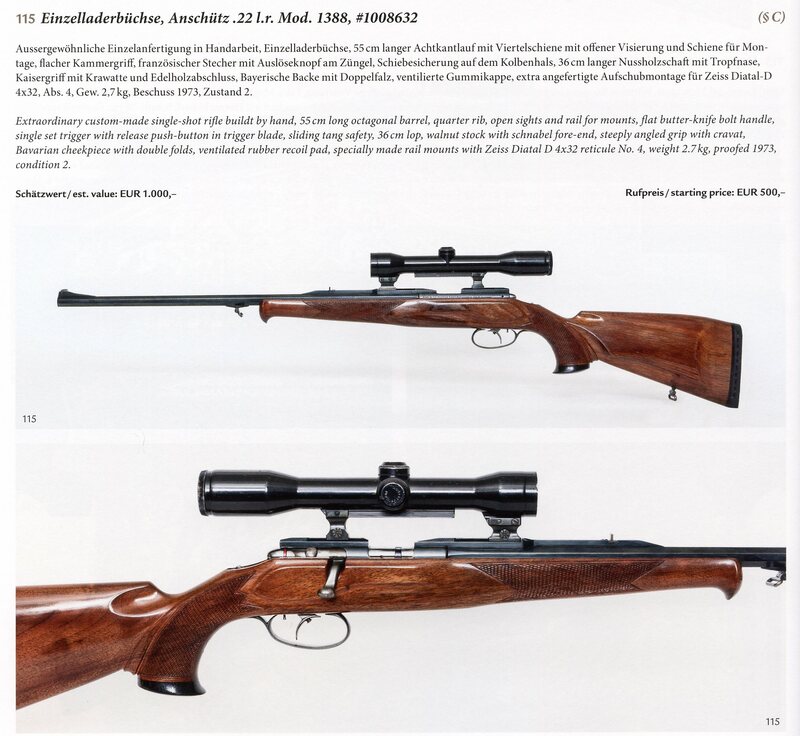 Savage-Anschütz- Supposedly starting in 1963 or 1964 The Savage Arms Co. in America had a partnership with the J. G. Anschütz Co. GmbH in Ulm, West Germany whereby Savage imported and sold Anschütz rifles in America and Anschütz imported and sold Savage rifles in Germany. This partnership ended about 1981. 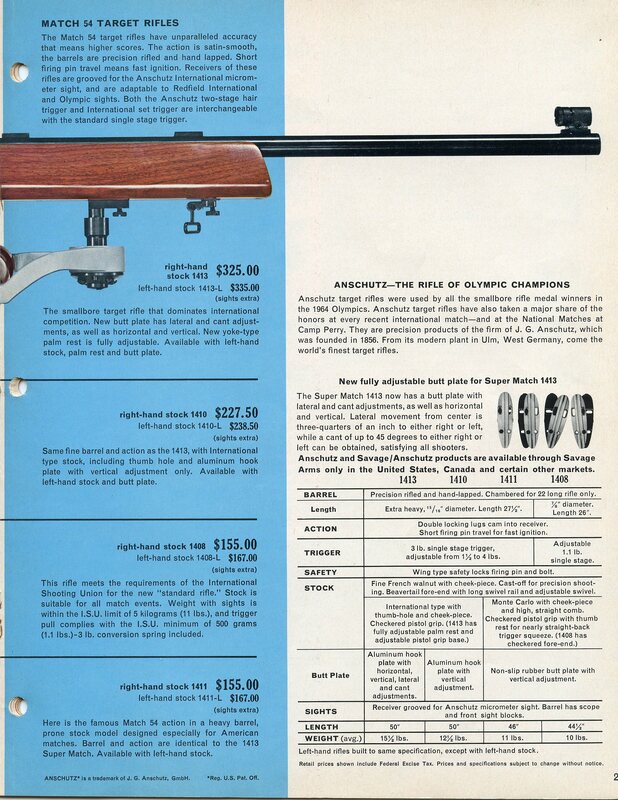 Following are pages from a 1968 Savage Catalog. Theodor Anschütz- A gunmaker at Eisenberg 6, Zella-Mehlis in 1929 and at Magdalenenstrasse 5 in 1936. Specialized in manufacturing revolvers. Udo Anschütz- Among the many gunmaking Anschützes, Udo (Nov. 17, 1862- Nov. 4, 1935) became the most famous. Born in Zella-St. Blasii, the son of Ernst August anschütz, an engraver. Udo built a national reputation for his superbly finished hunting and target guns and gained international fame for his highly accurate free pistols. As one might expect, Udo was apprenticed to one of the local gunmakers to learn the trade. Afterwards, as a journeyman, Udo went to München in 1883 to work for the famous Carl Stiegele firm. Three years later, in 1886 he returned to his home town a qualified Meister gunmaker and there established his own shop at Wiesenstrrasse 14. In the years to come, the firm Udo Anschütz- Zella-St. Blassii (U.A.Z. for short and his trade mark) became world famous for the quality and accuracy of its guns. They were especially recognized in German target shooting circles for their Scheibenbüchsen made on the Kolbe action and their own variation of the Aydt, a so called improved Aydt with an internal extractor. In May 1917 he moved his home and shop to the later well known address at Bahnhofstrasse 56. A significant development during these years was the U.A.Z. Rekord-Match free pistol which became internationally famous. In 1935 a World record score of 559 out of 600 was established with a Rekord Pistol. In 1925, Udo took his son-in-law, Franz Oskar Merkel into the firm. Franz (Sept. 10, 1898- 1977) the son of of the well known gunmaker Oskar Merkel, had learned his trade well in his father’s shop at Suhl where he continued to work until joining his father in law in Zella-Mehlis. Franz took over the firm when Udo Anschütz died and continued to produce the same high quality guns. In the same year, 1935, the U.A.Z. firm took over the production of the Büchel Luna and Tell pistols when the Büchel firm went on the rocks. Subsequently, U.A.Z. advertised that they were the sole maker of the Original-Büchel designs. The firm now operating as Franz Merkel-Vorm. Udo Anschütz, continued to prosper until World war II. The firm ceased to exist after 1945. The following four pictures are courtesy of the Rock Island Auction Co. and it is a 24 ga. shotgun with 32 3/4 inch barrels. It was sold as lot no. 3102 in their Sept. 9, 2018 Auction. 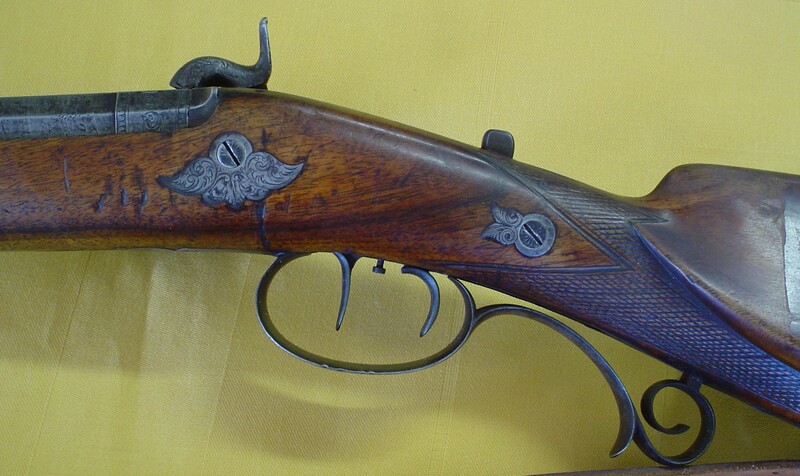 Courtesy of the Rock Island Auction Co.
Veit August Anschütz- A Meister gunmaker in Mehlis in May 1888. Walter Anschütz- A gunmaker located at Bockigter Stein 5 in Zella-Mehlis in 1936.